After we completed schematic design PACE engineers integrated local construction techniques for construction documents. 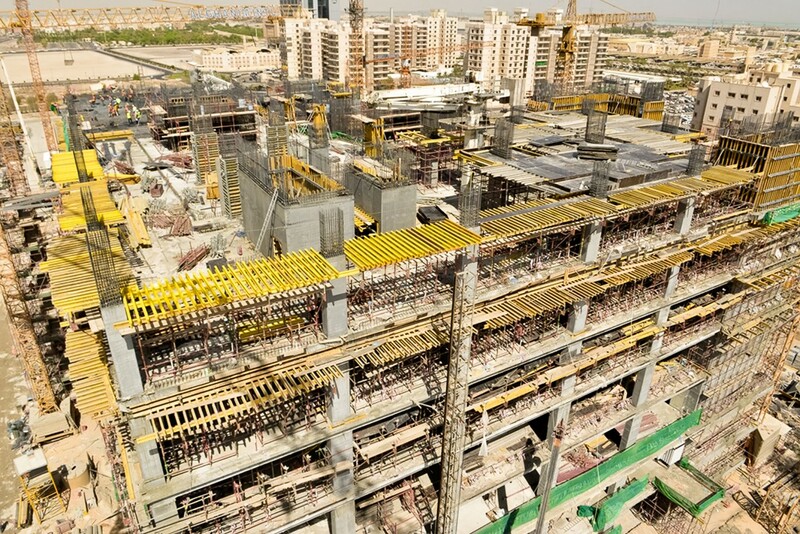 Construction commenced November 2013. Competing firms included Foster + Partners and Jacques Ferrier Architectures. The first and foremost importance in the expression of a Courthouse is its stability, permanence, fairness and stature within government. 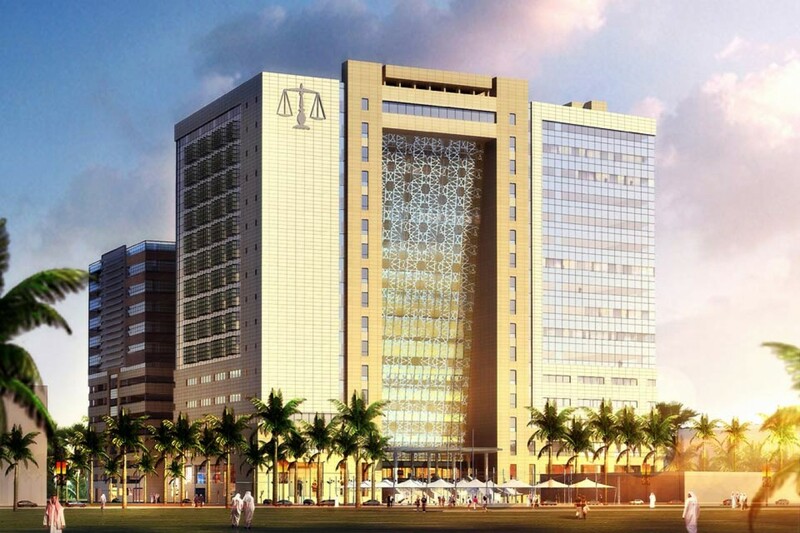 With the increasing complexities of society, this is accomplished by communicating the open and transparent judicial process that takes place within the building. 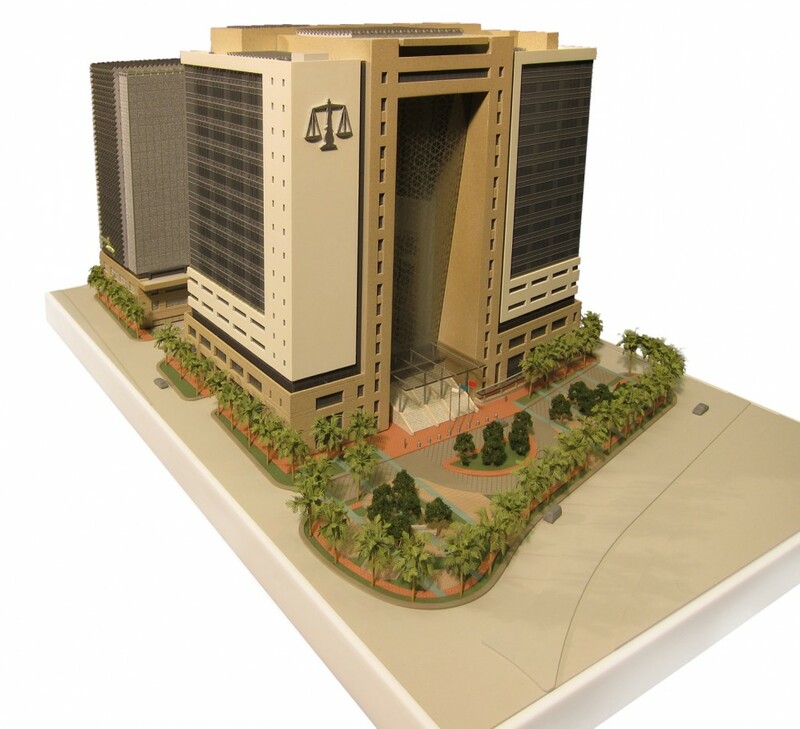 A strong architectural statement for the courthouse is essential: open and transparent yet secure; stable and permanent yet flexible for future needs; the issuance of justice one person at a time yet efficient and commanding respect; and finally integrated with the latest technology paired with a strong sense of history and purpose of dispensing justice to the people. 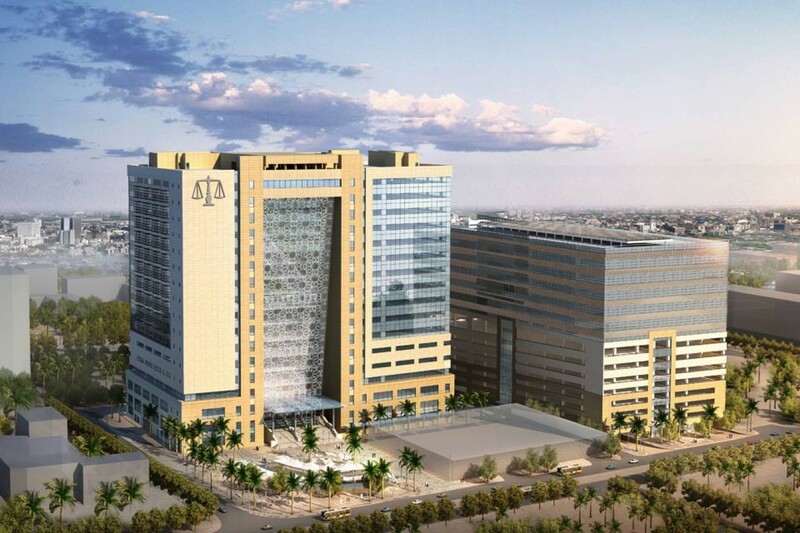 The foundation of planning and designing the modern courthouse is a clear and efficient planning strategy that separates the three types of circulation systems required: public, private or judicial and secure or prisoner. This is accomplished in the design. The public and private circulation systems occur horizontally, while the secure or prisoner circulation occurs vertically. The design creates an impressive central interior courtyard. This public hall is both the symbolic and functional focus of the courthouse. After traversing the majestic public steps in front of the public edifice and passing through security, the public enters a majestic and grand central atrium. The finely appointed grand interior room is rung with courtrooms on two sides and public elevators and offices on the third side. 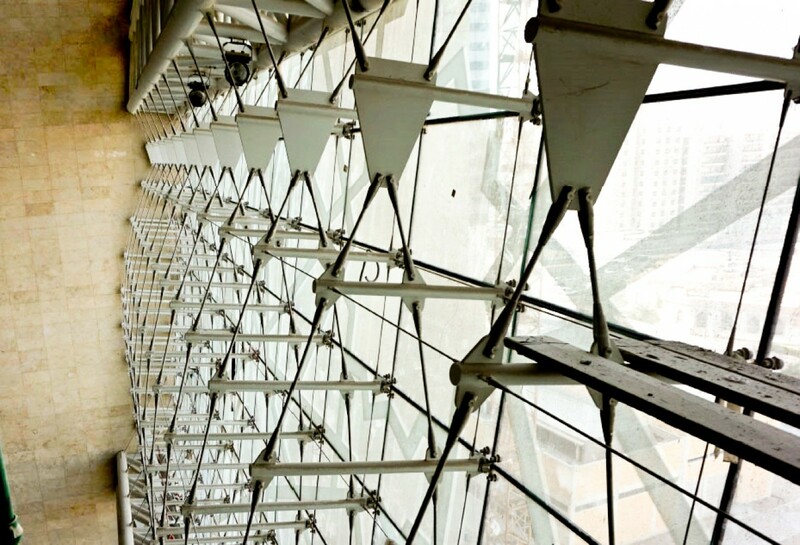 The large geometrically detailed wall of glass allows for the public to both see into the building as well as allowing visitors to view outside, while filtering the harsh sunlight. 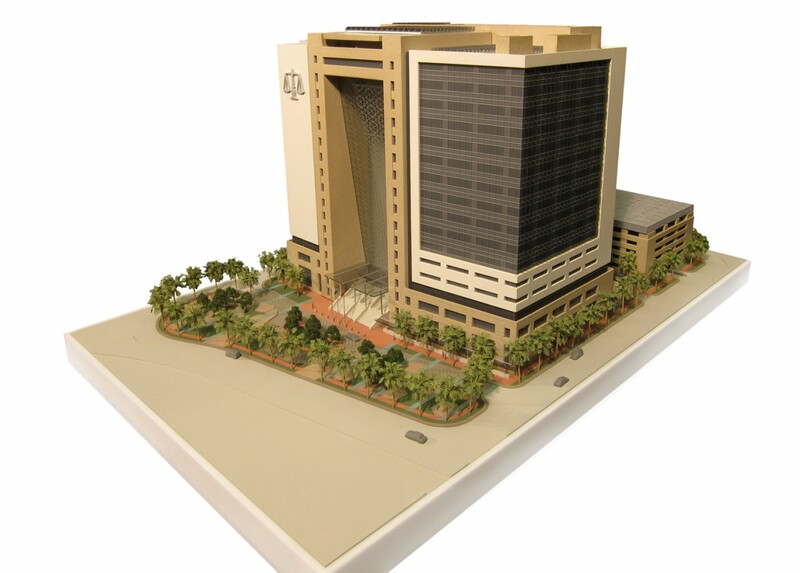 This creates both a strong entry to the civic building and expresses the openness and transparency of the business being conducted inside the courthouse. This connection between the inside and outside strengthens the civic purpose of the center of justice. The atrium acts as if a traditional courtyard were turned on its side with its opening to the public rather than the sky. This creates a functional and symbolic public space that is welcoming to the public. In contrast, a more traditional building entry would be opaque and uninviting to the public. 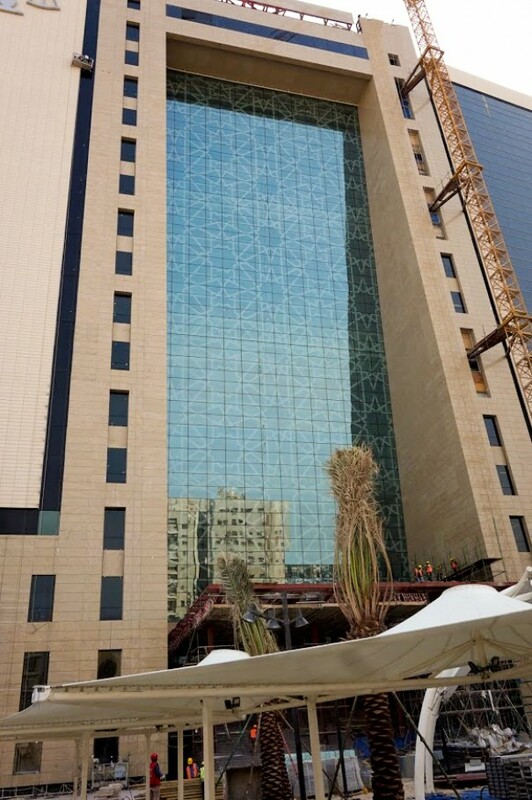 Contrarily, the Al Farwaniya and Al Jahra Courthouses use of glass expresses a sense of increased transparency of the judicial process and openness of the legal system. 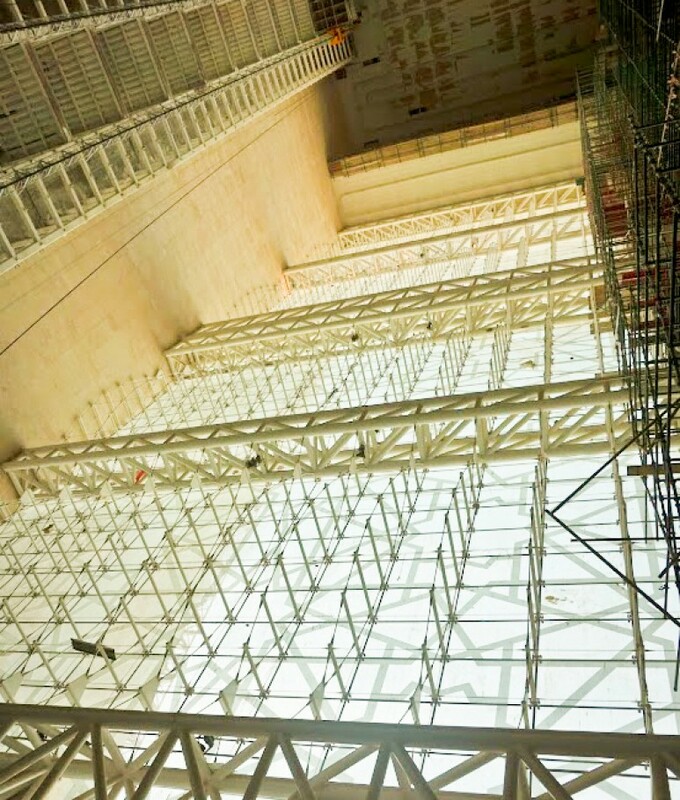 Views are also abundant from the interior space of the courthouses. 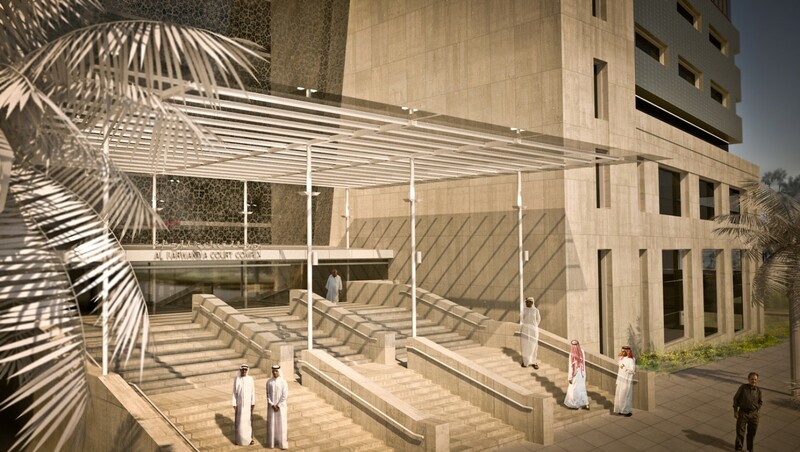 The design of the Al-Farwaniya and Al Jahra court complexes is an interaction between inspirational yet highly efficient spatial relationships and a reinterpretation of traditional Kuwaiti architectural elements and the art of Arabic calligraphy. These different generative concepts inform and strengthen each other in a pervasive way, each adding value to the other in every part of the building. 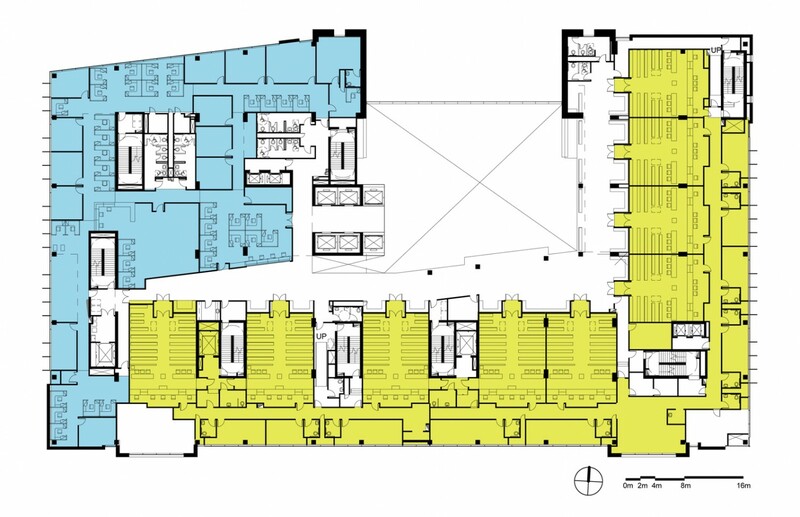 After extensive study of programmatic layout, an interlocking “L” shape provides the most efficient interaction between the three circulation zones (public, secure, restricted) and the spaces that they serve. The grand atrium holds these pieces together in a dramatic fashion (portfolio, fig.1). Arabic calligraphy has always been admired for its artistic merits. The architectural form derived is a strong connecting base with intermittent vertical extensions (portfolio, fig.2). This provides the building with a distinctive form and is empathetic to what it means to be part of a particular culture. As it wraps the building the interlocking “L” shape becomes apparent again. This also provides the building with an outward expression of stability as it creates a consistent thick plinth and rooted identity. The rational geometry of the courthouse is a physical embodiment of the judicial process. Permanence is given to the building as the Arabic derived form is written in stone. The vertical extensions accent and protect special parts of the building. One of those points being the open main entry of the building. 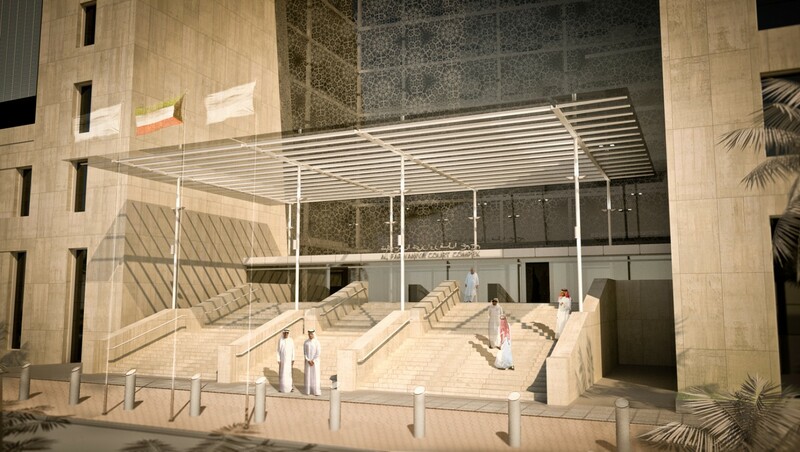 One common thread that can be seen in Kuwaiti architecture is attention to the main entry. The large glass wall at this point emphasizes the point of entry with its slope as the stairs rise to meet it. This key element is also decorated with an Arabic derived frit pattern that screens and creates interest with the southern light entering the building.